I seriously thought the title was Rage at first because Junco feels a massive rage at what’s been done to her. She wants to know why she’s been through hell. She wants her life and all the agony she’s been through to have been for a purpose. There are powerful, almost angelic like beings in her world and Junco is right up there on the power scale now. Things have been done to her and she’s been forced into a position she didn’t ask for with powers she doesn’t know the range of. Destruction is heading to earth and Junco and the people in her life are racing fate and trying to prevent annihilation. I liked the flashbacks. It helped paint a clearer picture of how she became the woman she is and what hell she’s survived… multiple times. I was in awe of her survival skills. Though her survival was not without cost to her sanity. She gets it. She knows she’s past the brink, but she’s not ready to roll over and quit, she has a task to complete. As always the secondary characters are very important. I ached for her and Tier’s relationship. I grieved with her over the loss of a loved one. I was glad she had Gideon to keep her grounded. I was mad and sad with her as those she trusts try to keep her in the dark. Gahhh! There were bright moments that made me chuckle, but on the whole this chapter of her journey is very dark and vengeance-y. I love J.A. Huss’ writing. It’s powerful and packs a punch. I was gripped by this story. I had to stop and re-read lines multiple times. Beautiful lines about fate, destiny, loss, love and determination. Junco is very determined to get retribution for what’s been taken from her. A few of my fav lines… It is so hard to pick out a couple to highlight. READ this series! I am glad to know there is another book in the works. This was a painfully beautiful book and I’m not ready to be finished with Junco. I’m aching for the next chapter of her journey. I want so much more for her. I’m impressed and in awe of the author’s storytelling ability and how much she has made me care. I am caught up in this adventure and all the plots, schemes, aliens, power plays and Junco’s journey. 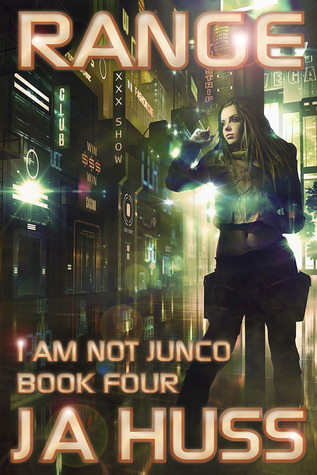 Go read the Junco books if you like science fiction/fantasy, if you are open to a heroine who lives in a brutal, complicated world and fights for peace…. READ Junco. Next PostNext I Am Just Junco Spotlight on Range + Character Interview + Contests!